I had family visiting from out of town today so wouldn't have time for any last minute birding. Yesterday was my final chance to find any new species for 2010. I ended up locating something that wasn't even on my radar. Snow removal problems around New York City, as well as, major disruptions on most bus and subway lines made birding anywhere but Prospect Park nearly impossible this week. I finally decided to take a chance with the "F" train and head down to Coney Island yesterday. Heydi, who had been trapped in that mass transit blackhole known as Marine Park, would attempt to join me. 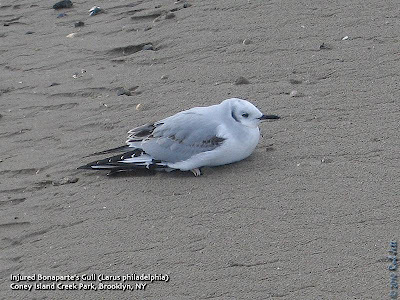 We wanted to try and find either a new Brooklyn gull for the year (Iceland?) or a Common Eider. Our usual loop for Coney Island starts on the boardwalk at Stillwell Avenue, scanning the bay east of the pier, then to the Steeplechase Pier, scanning the south bay, the jetty at the western-most end of Coney Island, then walking north, checking Coney Island Creek from various vantage points, returning to Stillwell Avenue either along Surf Avenue or the boardwalk. We both arrived at the Stillwell Avenue station without incident (it only took the MTA 4 days to restore most of the subway service to normal) and headed directly to the boardwalk. 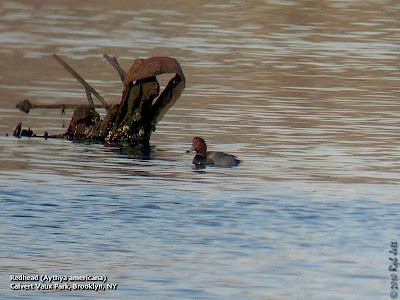 I quickly spotted three loons close to the second rock jetty east of the pier. Two were Common Loons, the other was a guy in a speedo swimming in the frigid water. The surf was calm and there wasn't much bird activity on the horizon. The dominant species of waterfowl was Red-breasted Merganser. Resting on the sand parallel to the shore were hundreds of Ring-billed Gulls and much lower numbers of Herring and Great Black-back Gulls. I noticed that several of the gulls had a dark, oily substance on their belly and breast feathers that they were attempting to clean. I had also spotted gulls with similar staining in Prospect Park. Heydi had seen some at the marsh in Marine Park. I wonder if there was an unreported spill somewhere close to NYC. 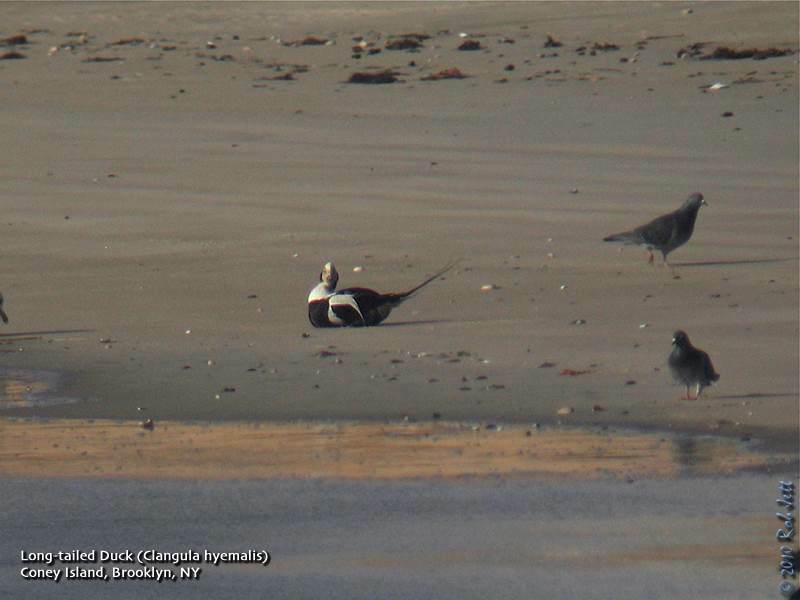 As we scanned the water adjacent to the rock jetty that separates the gated community of Seagate from Coney Island, I spotted a Long-tailed Duck preening on the beach. These seaducks are usually only viewed relatively far from shore, so observing one preening onshore was a nice treat. There was a small flock of Purple Sandpipers feeding within the seaweed draped boulders on the western side of the jetty. I watched closely as one drew its bill along lengths of the green vegetation, not actually eating the seaweed, but just sliding off any arthropods that might be attached to it. These sandpipers have a habit of clinging to rocks right at the edge of rough surf, so I actually overlooked a few that were just a couple of yards away when I was watching the Long-tailed Duck. When I finally noticed them, they held their ground, but peered suspiciously over their shoulders at me. 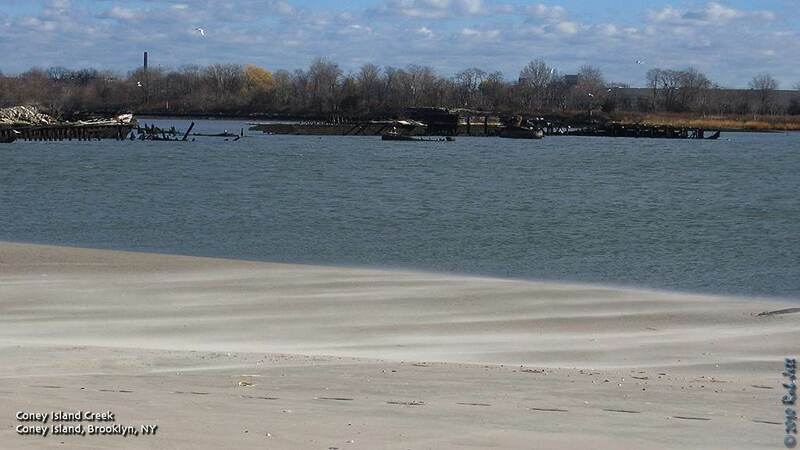 Sunshine was glistening off the surface of Gravesend Bay and Coney Island Creek. The water was calm and surprisingly serene. A sliver of jagged water flowed passed Norton's Point and upriver towards the Verrazano Bridge. This nutrient rich current attracted a flock of diving Long-tailed Ducks. Farther up the creek was a single Common Loon and scattered flocks of Canada Goose, Brant, Gadwall, American Wigeon, American Black Duck, Mallard, Greater Scaup, Bufflehead, Red-breasted Merganser and Ruddy Duck. There was a flurry of gull activity in the water at the end of West 23rd Street. A man from a local bakery was dumping a large box of French bread loaves into the creek. The result was that every gull, black duck and Mallard within a 1/4 mile radius descended on that patch of creek. I sat down on a steel guard rail at the edge of the shore, put my bins to my eyes and tried to pick out a rare gull from the riot of white, black and gray plumage. After several frustrating minutes, I turned my attention to the cove on the opposite side of Coney Island Creek. It's a small inlet dotted with the rotting, rusting hulks of several old barges. Alex Wilson found a rare Western Reef Heron in that cove during the summer of 2007. It was 3pm and there was a little over an hour of decent light left. I accepted the fact that I probably wasn't going to add anymore species to my 2010 list, but I had nothing to complain about. It had been a very good year. Sitting on the guard rail, I continued to casually scan the waterfowl across the water in late afternoon light. Suddenly a bird appeared from behind the wooden rib of a submerged barge. I mumbled something incoherent to Heydi, then jumped up and grabbed my scope. Adjusting my focus I said, without taking my eye off the bird, "It's a Redhead!" The last time I observed one of these handsome ducks in Brooklyn was in March of 2001. Heydi got the bird in her scope and we both watched it slowly paddling back and forth, away from all the other ducks. After several minutes, we looked up from our scopes and high-fived each other. I took out my phone and texted Peter and Shane. Most birders will agree that finding a good bird is great, getting to share it with others is even better. Here's to another year of discovery and sharing. 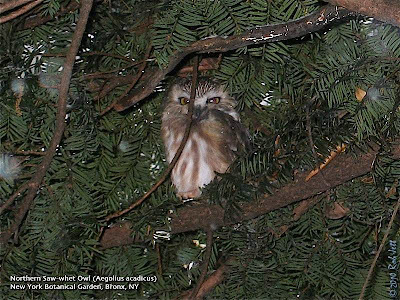 I can't think of a better bird to end a year of Friday's Fotos than this tiny Northern Saw-whet Owl from the Bronx. 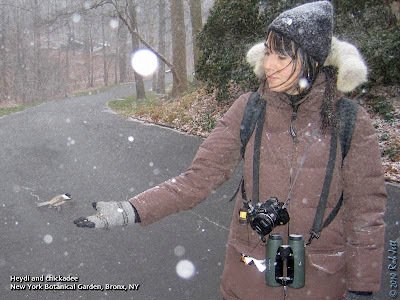 Last Sunday was the Bronx/Westchester Christmas Bird Count. With a potential blizzard working its way up the east coast, I was concerned about our chances of finding ANY birds. As anyone who reads the paper or watches television knows by now, we did get slammed, but it didn't stop us from finding a few good birds and having a good time in the Bronx. This year Heydi joined Shane, Steve and myself for our annual survey of the birds within the New York Botanical Garden. I always enjoy wandering around the garden's 250 acres, especially for the first 3 hours, before it is open to the public. One of our team's main responsibility was to find the resident Great Horned Owls as they are usually the only pair located in the West Bronx. The varied habitats in this location includes the Bronx River, so we tend to compile an interesting mix of species by the end of the day. Upon entering the main entrance of the garden we always walk up a low rise behind the gift shop and check a stand of conifers for owls. There was some evidence that an owl had been roosting there this year, but we didn't find any. As Steve, Shane and Heydi were still checking the evergreens, I began walking down the rise, towards the main roadway. Suddenly, two Wild Turkeys appeared in front of me and began strutting up the hillside. They stopped at the top of the rise and posed for a moment or two so Steve could take some photos. When he was finished they nonchalantly continued on their way. I've seen Wild Turkeys in the Bronx at Pelham Bay Park. This was the first time that we've noted them for the Bronx CBC. They seem to be expanding throughout NYC and it's only a matter of time before they show up in Brooklyn. Shane thought that he had heard the chittering of a Winter Wren in Everett Children's Adventure Garden. He plugged a small pair of speakers into his iPhone and briefly played the energetic song of the wren. Within seconds the bird appeared and hopped up onto a branch only a couple of yards from us. We continued through the children's section where we found lots of robins, White-throated Sparrows, a Song Sparrow, several juncos and a few House Finches. As we approached the exit, some of the songbirds began making alert sounds while others flew for safety within dense shrubs. Perched low in a tree just off the path was a juvenile Red-tailed Hawk. The young raptor didn't seem to mind that we walked over to take a few photos. He mostly ignored us, but I think I saw him wink at Heydi. Later on we observed two more young Red-tailed Hawks hanging around each other. Throughout the morning we came across a total of 5 red-tails - three juveniles and two adults. The adults were heard periodically calling back and forth to each other. I'm guessing that the juveniles are the offspring from the pair that nested on the library building. You can read about them here. The Bruckman Crabapple Collection is usually a busy spot for songbirds in the winter. The trees hold onto the red fruit late into the year allowing them to soften enough for the songbirds to eat. We found robins, Blue Jays and House Finches monopolizing the small trees, plucking the abundant fruit from the branches. Mourning Doves were picking up dropped fruits from the ground beneath the trees. At the hillside overlooking the crabapples is a stand of mature conifers. We occasionally find late orioles or Pine Warbler in this area, but it was devoid of birds this year. Several large areas of whitewash indicated that there was a large raptor using this stand as a roost, but we didn't find anyone home on Sunday. At the trail that follows the edge of the Bronx River we came upon piles of wood chips at the base of two gnawed trees. 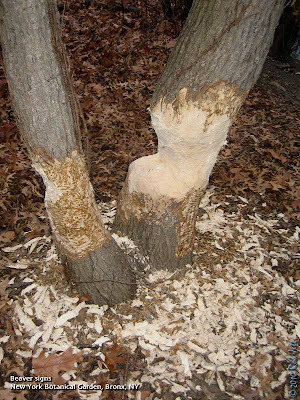 Could there be a beaver in the New York Botanical Garden? It looked as if the culprit was stopped early on in the project. 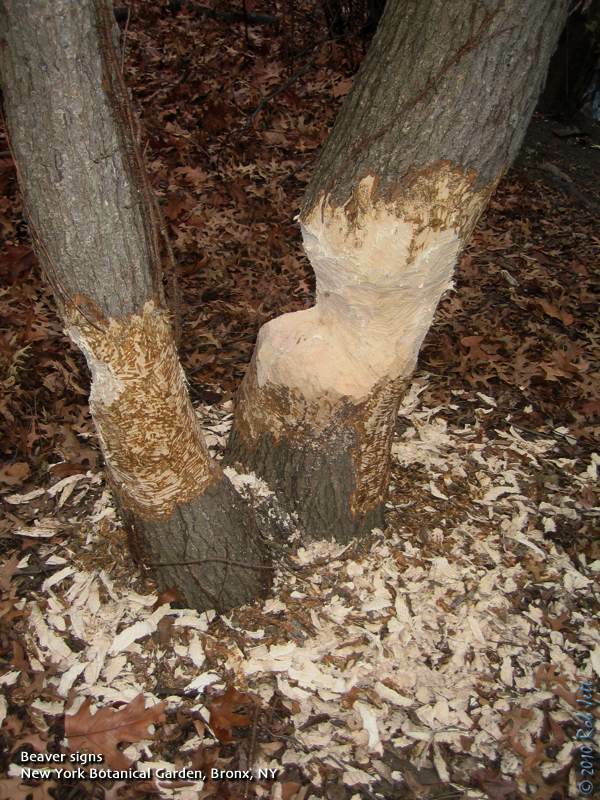 There had been stories published in the local newspapers about a beaver spotted near the Bronx Zoo. He was nicknamed "Jose", after Bronx Rep. Jose Serrano. Apparently, Jose now has a friend, "Justin Beaver", so perhaps the now crowded neighborhood has forced the latter to swim upstream in search of new territory. As we were examining the scene-of-the-crime and scanning the river for suspects, Steve spotted a Great Blue Heron perched on the opposite shore. It would end up being the only great blue observed for the Bronx CBC. 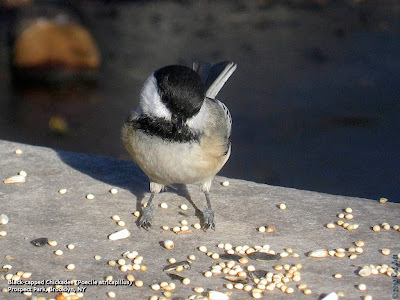 We spotted lots of Black-capped Chickadees this year...very hungry chickadees, I might add. At one point several chickadees seemed to be uncharacteristically friendly and approached very closely. I stuck my hand out and one of the tiny birds flew over and landed on my gloved hand. We didn't have any seeds, but Shane offered one of his granola bars. I crumbled it up in my hand and we were immediately approached by nearly a dozen birds. I've fed chickadees by hand many times over the years, but never in the NYBG. I was really surprised at how habituated these birds seemed to be, especially since I'd never noticed it on 5 previous Christmas Bird Counts at the garden. Shane and Heydi had never hand fed chickadees, so it was really amusing to watch the child-like looks of amazement on their faces as these minuscule, black and white creatures perched on their hands. The snow began to fall by 11am. At first it was just a very light sprinkling, but the wind gradually picked up as did the precipitation. Steve needed to leave early, so we decided to look for the Great Horned Owls earlier than normal. Without giving away any details, I spotted the silhouetted profile of the pair side by side near a preferred roost. We checked them off the list. A short while later, we located 7 Hooded Mergansers swimming up the river. I spotted an 8th individual a short time later. These boldly patterned waterfowl are a personal favorite and I believe that this was the most we've ever recorded for the Christmas Bird Count in the garden. The snow began coming down harder, but there was one more surprise in store for us before we called it quits. Steve has always been obsessive about checking every possible owl roost in the botanical garden. 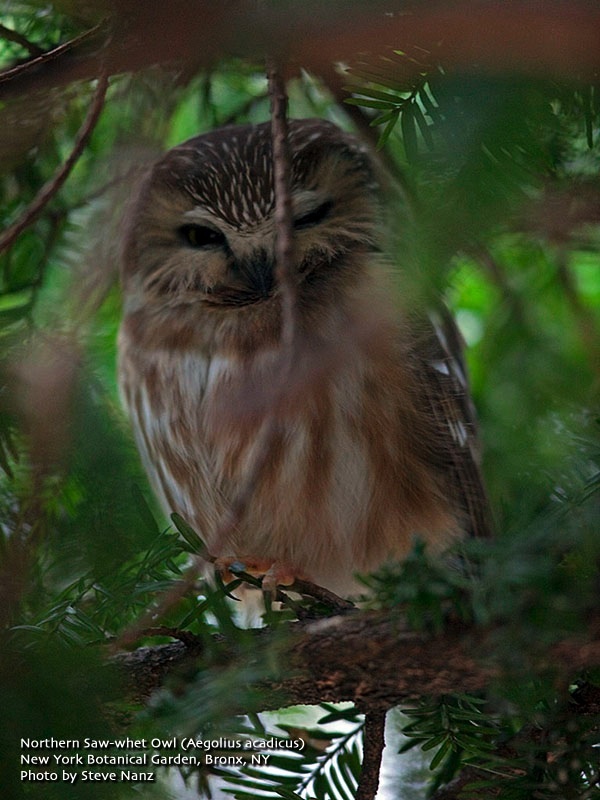 One year we found a Long-eared Owl, (which he walked right passed) but he really wanted to find what I consider to be the "chipmunk" of the owl family - a Northern Saw-whet Owl. This bird of prey is approximately the size of an American Robin. It's large head and big eyes give it the appearance of a young bird. I'm pretty sure that everyone that spies this creature makes an audible "aaawwww" sound. 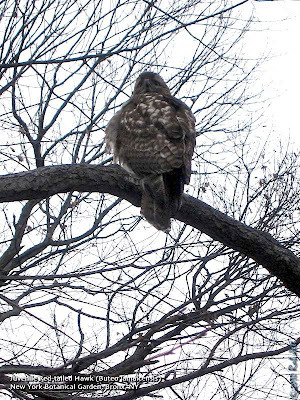 To many, it is the holy grail of winter birds in NYC. As far as I was concerned, Shane, Heydi and I were doing a pretty good job searching every tree and shrub along our path, but Steve, well, Steve seemed more like a bloodhound on a mission. Finally, at around 10am, I heard Steve laugh, then he came running back to the rest of us. "I can't believe", he said. "Every year I search for these birds and I can't believe that I've finally found one." He lead us to a spot near an evergreen and, very proudly, pointed to the tiniest, cutest saw-whet owl that I'd ever seen (although, they are all adorable). 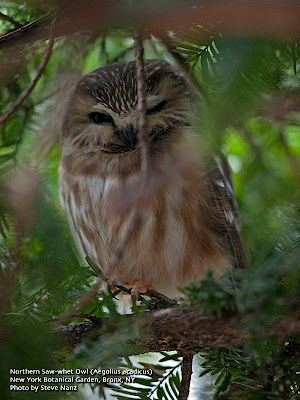 The owl seemed only mildly concerned about our presence as we took a few photographs before continuing to count birds. Steve had to leave early to meet family in the city. Shane, Heydi and I continued the survey, but by noon the snow was starting to make counting birds difficult. After a brief lunch break we headed back into the storm to try and find a few more birds. That idea last for about 20 minutes. Wind driven snow made using our binoculars nearly impossible and birds were hunkered down for the long haul. At 1pm we decided to call it a day, three hours short of our normal Christmas Bird Count. Despite the short day and poor conditions we still managed to locate 36 species of birds for a total of 649 individuals. Seems like there's always something new to discover. I can't wait until next year. Conditions: 27-29 degrees. Windchill was approx. 13 degrees. Snow flurries began by 10:30am. Heavier, blowing snow by noon. By 1pm conditions too poor to continue birding. Daily, December 26 - January 2, 1-3 p.m.
Where do squirrels get their food during the cold winter months? How do birds stay warm in a blizzard? Find out the answers to these and other questions the Audubon Nature Center. Sunday, January 2, 10 a.m.
With the American Littoral Society. Guides: Mickey Cohen, Don Riepe. 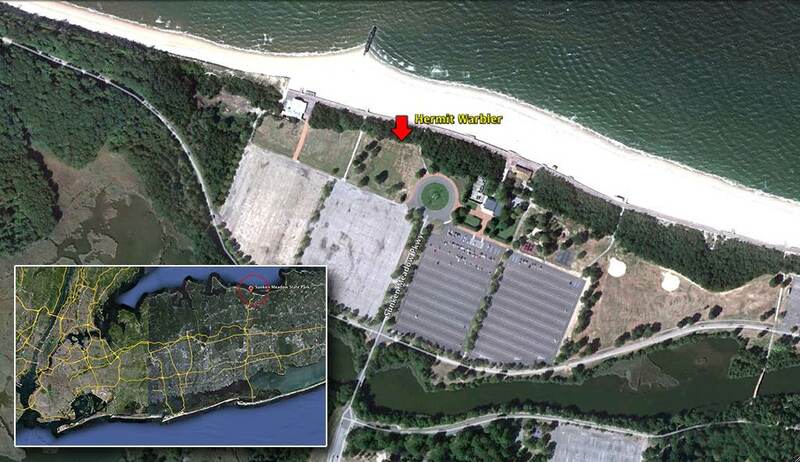 Meet at Building #1 in Fort Tilden, Breezy Point, Queens. Start out the New Year with a brisk hike on the beach. 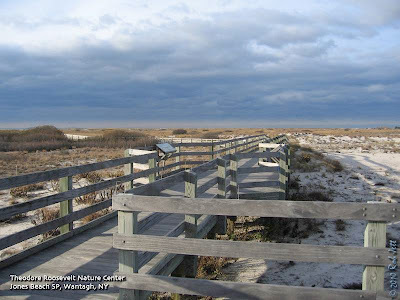 Visit the dunes, woods, and hawk watch platform. Afterwards, return to the Rockaway Artists' Alliance for complimentary cookies, cake, coffee, tea and champagne. Other walks at the same time at Jones Beach, Fire Island, and Sandy Hook, NJ. No reservation necessary. For more information and directions contact Don Riepe at 718- 318-9344 or donriepe [AT] gmail.com. No limit. Free. Saturday, January 1, 2011, 12 noon to 2:00 p.m.
Protectors of Pine Oak Woods and Natural Resources Protective Association are your hosts along with many other environmental groups including NYC Sierra Club, NYC Audubon and SI Museum. Take a half hour leisurely stroll of the beach to Crooke’s Point at gateway National Recreation Area. We expect many dozens of walkers. All are encouraged to join and share their past successes and goals for the year 2011. Many like to bring a treat to share with others. Meet at 12 noon at the main entrance parking area off Hylan Blvd. across from Buffalo St. From there we will carpool to the last beach house and walk half a mile to the point to celebrate the New Year with safe bubbly. For more information call Cliff Hagen at (718) 313-8591 or Jim Scarcella at (718) 987-6037. Greetings. 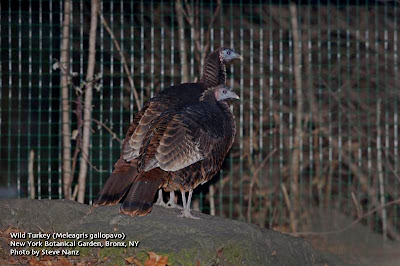 This is the New York Rare Bird Alert for Friday, December 24th 2010 at 9pm. The highlights of today's tape are VARIED THRUSH, EARED GREBE, BARROW'S GOLDENEYE, KING EIDER, GREATER WHITE-FRONTED GOOSE, GLAUCOUS GULL, ICELAND GULL, LARK SPARROW, RED CROSSBILL and WHITE-WINGED CROSSBILL. Certainly one of the most unusual Christmas Count birds so far has to be the VARIED THRUSH in the Central Park section of the Lower Hudson Count. The thrush tending to wander somewhat lately does continue to frequent the edges around the Maintenance Field and buildings just south of the 79th Street transverse. The closest park entrance is at 5th Avenue and 79th Street and continuing across the roadway to the maintenance buildings and field. Also in the park has been an immature RED-HEADED WOODPECKER usually found near the southeast corner of the Sheep Meadow. The Montauk Christmas Count last Saturday reported 129 species highlights featuring 6 HARLEQUIN DUCKS, a drake KING EIDER off the south side of Montauk Point, 6 RED-NECKED GREBES, 2 BALD EAGLES and 4 ROUGH-LEGGED HAWKS; at Gardiner's Island 3 VIRGINIA RAILS, an AMERICAN WOODCOCK, 2 ICELAND GULLS, 4 LESSER BLACK-BACKED GULLS, 176 RAZORBILLS, a YELLOW-BREASTED CHAT and LINCOLN'S SPARROW. The Brooklyn Count on Saturday netted 125 species including a HARLEQUIN DUCK, KING EIDER still present today off the eastern end of Fort Tilden, RED-NECKED GREBE, 7 RED-SHOULDERED HAWKS, AMERICAN OYSTERCATCHERS, BLACK-LEGGED KITTIWAKE, LESSER BLACK-BACKED GULL, 3 BLACK SKIMMERS at Coney Island, COMMON RAVEN, 6 ORANGE-CROWNED WARBLERS along with 2 PINE WARBLERS, 2 PALM WARBLERS and 2 COMMON YELLOWTHROATS, LINCOLN'S SPARROW and 1 RED CROSSBILL. The Northern Nassau Count Saturday tallied 105 species featuring GREEN HERON, ORANGE-CROWNED and PALM WARBLERS and a LINCOLN'S SPARROW. On Sunday the Captree Count recorded 119 species highlights including 2 GREAT EGRETS, OSPREY, BALD EAGLE, 2 VIRGINIA RAILS, ICELAND GULL, BLACK-LEGGED KITTIWAKE, 5 RAZORBILLS, EASTERN PHOEBE, MARSH WREN, ORANGE-CROWNED WARBLER, OVENBIRD, COMMON YELLOWTHROAT and 8 BOAT-TAILED GRACKLES. The Sagaponack Count Sunday netted 114 species featuring 5 GREATER WHITE-FRONTED GEESE and a CACKLING GOOSE these usually either on Hook Pond or on a field along Further Lane in East Hampton. A drake BARROW'S GOLDENEYE, back again off Bay Avenue at Long Beach in Noyack, 4 RED-NECKED GREBES, an EARED GREBE off Main Beach in East Hampton, 2 BALD EAGLES, 31 RAZORBILLS, 2 NORTHERN SAW-WHET OWLS, HOUSE WREN, 6 CHIPPING SPARROWS and 3 VESPER SPARROWS, 2 RED CROSSBILLS over Northwest and a WHITE-WINGED CROSSBILL at Hook Creek on Pondview Road in East Hampton. 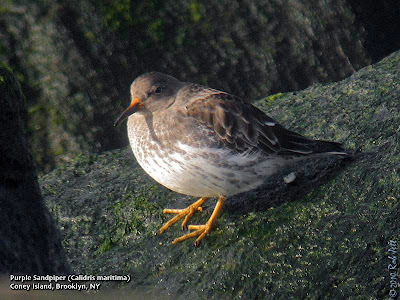 The Queens Count Sunday among its 112 species featured SEMIPALMATED PLOVER, COMMON RAVEN and NORTHERN WATERTHRUSH. The Greenwich-Stamford Count Sunday, including parts of Westchester County, tallied 108 species including RED-NECKED GREBE, 3 plus NORTHERN GANNETS, 4 BLACK VULTURES, BALD EAGLE, BARRED OWL, NORTHERN SAW-WHET OWL, MARSH WREN, COMMON RAVEN and COMMON YELLOWTHROAT. 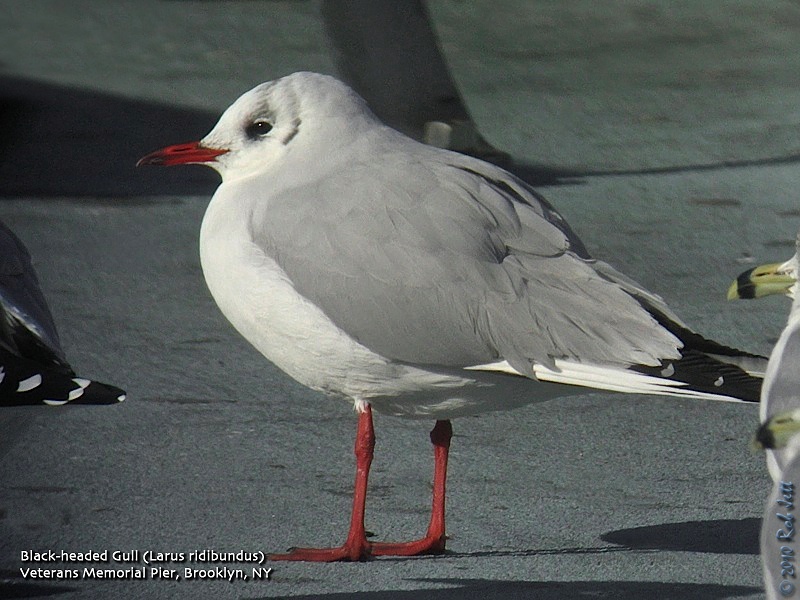 In Brooklyn the adult BLACK-HEADED GULL in Bay Ridge was relocated Thursday and seen again today while an immature BLACK-HEADED GULL was also found at the same location this being on the fishing pier at 69th Street which is near the Owl's Head waste water treatment plant where BLACK-HEADED GULL could also be found last winter. Also in Brooklyn today 3 HARLEQUIN DUCKS were spotted off Beach 169th Street at Fort Tilden. Out on eastern Long Island a drake BARROW'S GOLDENEYE has returned to the north fork where it usually can be found off the eastern end of the Route 25 causeway between East Marion and Orient. Also on Monday the now 2nd year GLAUCOUS GULL, not in full health, was still near the Orient Point Ferry Terminal. Also on the north fork a GREATER WHITE-FRONTED GOOSE was on Marratooka Lake off New Suffolk Avenue in Mattituck last Saturday. Today another GREATER WHITE-FRONTED GOOSE was spotted on Tung Ting Pond off Center Shore Road in Centerport. The LARK SPARROW found last week at the Calverton Grasslands at the former Grumman Airport was still present today along Grumman Boulevard. The sparrow is usually with other sparrows along the chain link fence west of the main entrance to the grassland complex and often near the closed entrance a couple of hundred yards west of the main entrance. A COMMON RAVEN was also noted at the grasslands last Sunday. This service is sponsored by the Linnaean Society of New York and the National Audubon Society. Happy holidays. 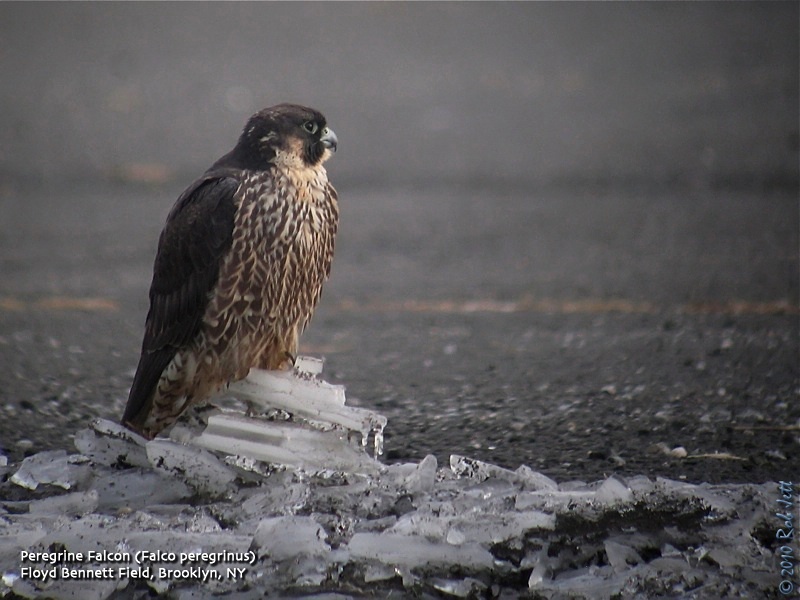 A Peregrine Falcon staying cool on an unused runway at Floyd Bennett Field. Able to reach speeds of 200 miles per hour in a dive, this is unquestionably the fastest animal on the planet. What an exquisite animal. Last Saturday I participated in the 111th Annual Christmas Bird Count. 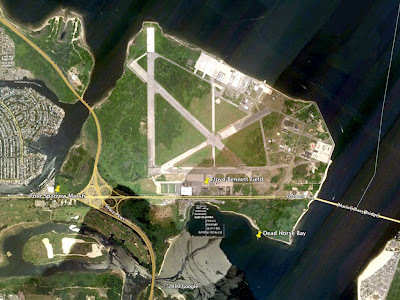 I joined a team of people covering Floyd Bennett Field, Dead Horse Bay and Four Sparrow Marsh. This was my 9th year doing the count at Floyd Bennett. It would have been 10, but I was forced to sit out the count in 2002 due to a broken arm. Anyway, it was a good day with one exceptional sighting to report. I've experienced some miserably cold Christmas Bird Counts along the exposed habitats of Floyd Bennett Field, but Saturday wasn't one of them. There was an expected December chill in the air, but winds were calm and it was actually quite pleasant. We had eleven enthusiastic volunteers, the most since I've been doing the count at Floyd. 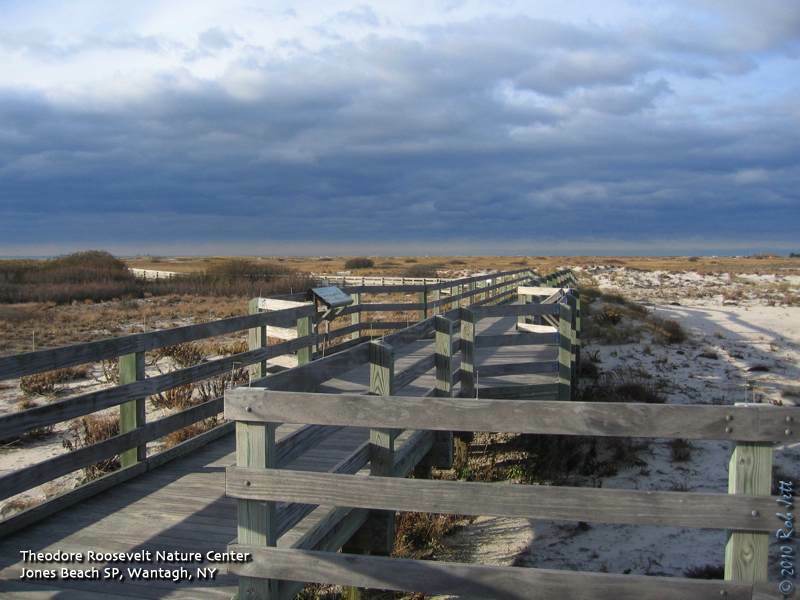 The survey involves walking the entire length of all the grasslands, as well as, all the surrounding habitats, including scanning the extensive coastlines at both the Dead Horse Bay and Jamaica Bay sides of the peninsula. It is a lot of area to cover during nearly the shortest day of the year and some spots are usually overlooked. This year we finally had enough people to break into teams to cover the entire place. I looked forward to finding some good birds. Before we actually got started in earnest, we spotted the best bird of the day, and possibly the count. It was around 7:30am, Ron was finishing up the sign-in sheet and counting everyone's registration fees. Adam had walked across the roadway to a small stretch of grass that borders a section of dying conifers. He had spotted a small sparrow that he couldn't identify. The rest of us joined him as it sounded like an interesting bird. We were standing opposite the parking lot when our attention was drawn to the sky in the direction of the main runways. A noisy flock of American Crows were coming our way while mobbing a bird. I expected it to be a Red-tailed Hawk or some other raptor. As I lifted my bins to focus on the bird, I heard Dave say, "It's a raven!" Then I heard the unmistakable, raspy "crooakkk" of a Common Raven. The bird came to rest at the top of a dead pine tree about 300 yards away. The crows, which were dwarfed by this huge corvid, gave up harassing the bird and flew off. The raven croaked several more times before taking off, flying south towards the Gil Hodges Bridge. A few people in the group had cameras, but I think we were all so stunned to see this bird in Brooklyn that nobody took any photos. 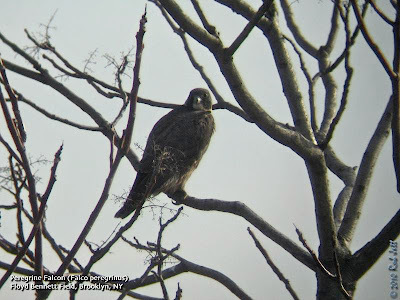 We found out later in the day that the team covering Fort Tilden (south of Floyd Bennett) had spotted a distant raven. It is unlikely that a second Common Raven was in the area, especially since the individual we observed headed off in the direction of Fort Tilden. Knowing that there were dozens of birders in the area, I had commented at the time that I hoped none of the other teams saw "our bird". I had a feeling that by beginning our day with such a rare sighting, everything else would just be commonplace. To a certain extent, it was. There were no unusual waterfowl to report at Dead Horse Bay. In fact, the annual overwintering scaup flock had been MIA until that morning. There were only about 200 Greater Scaup at the bay, compared to several thousand last year at this time. I was hoping to find some Lapland Longspurs in the Horned Lark flocks at the cricket field, but did not. The larks moved about quite a bit, so we returned to the cricket field a few times to rescan the flocks. The first time we were there, a Peregrine Falcon flew over and scared off all the birds. The second time we went back, the same falcon was perched in a sumac tree at the edge of the field. The young, female peregrine was so docile that it allowed Adam to walk right up to the tree to take some photos. We considered that it might have been someone's hunting bird, but close up photos of the legs showed that the bird was not banded. Had it been a trained bird there definitely would have been bands and likely even jesses on her legs. The only other unusual species that we spotted during the count was a Common Yellowthroat. This warbler is rarely seen around NYC during December and I was fairly confident that it would be another "save" for our team. At the compilation dinner, we learned that this year Brooklyn had the highest number of participants in its history - 78. Like our team, many areas had more than the usual number of eyes counting birds. I suppose the good weather played a part. Brooklyn finished the day with a total of 125 species. Of the 125 species recorded, 15 were "Irregular", 10 were "Rare" and 1 was a Brooklyn count first. Birds categorized as "Regular" are species that have been reported 8 - 10 years of the last 10 years. "Irregular" is defined as being reported 4 -7 of the last 10 years and "Rare" means that they have been recorded 0 - 3 of 10 years. The irregular species this year were Redhead, Common Eider, Common Merganser, Great Egret, Red-shouldered Hawk, Ruddy Turnstone, Black-legged Kittiwake, Lesser Black-backed Gull, Short-eared Owl, Brown Thrasher, Orange-crowned Warbler, Common Yellowthroat, White-crowned Sparrow, Rusty Blackbird and Pine Siskin. The rare species were King Eider, Harlequin Duck, Turkey Vulture, American Oystercatcher, Black-headed Gull (only seen during the "Count Week"), Black Skimmer, Great Horned Owl, Pine Warbler, Lincoln's Sparrow and Red Crossbill. The Common Raven had never been recorded on a Brooklyn Christmas Bird Count before Saturday. According to Ron Bourque, it had NEVER been observed at Floyd Bennett Field. Perhaps this was an offspring from the Queens nest that is now looking for its own territory. There is always a friendly competition between the 11 teams to see who can get the most "saves". This year there was a four-way tie for first place between Owl's Head Park, Marine Park, Spring Creek and Riis Park. These locations all had 4 saves. As always, Steve Nanz's team at Spring Creek tallied the most warblers with 4 species. His sighting of a Common Yellowthroat deprived our team of another save, but I didn't really mind, because a "Count First" definitely trumps a "save". 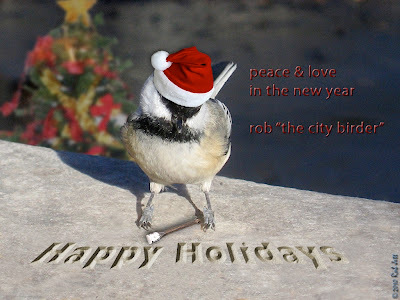 To see the Brooklyn Christmas Bird Count tally in its entirety, just click the image below. I was so excited to find your post. I'm writing a history of Mr. Taber's home town, Meridian, New York, and there will be a chapter on Ernie, a small-town polymath. There is a tale that Frank Chapman of the American Museum of Natural History, after having read many of Ernie's articles, visited Ernie at Meridian. Ernie took Chapman out on Otter Lake with the goal of finding a bittern nest. Both had their cameras. Chapman apparently took many, many photos, and Ernie just one. Ernie's was perfect. Chapman's were unusable. His glass plate negatives still exist in the possession of a retired biology professor and birder (also from the environs of Meridian). There are plans to donate them to the New York State Museum. Ernie died in 1954, after a long career as a birder, collector of Iroquois artifacts (many in the collection of the Museum of the American Indian in D.C.), philatelist, numismatist and taxidermist. He served as Cayuga County Clerk for something close to thirty years, and also served in several other capacities in local government. His large collection of mounted birds and small mammals is on display at the Cato-Meridian Middle School, in Cato, NY, just a mile from where Ernie lived. He was a fascinating man. Fame can be a capricious thing, for any kind of beast. So no disrespect to Pale Male, the über-hawk of Fifth Avenue, but he’s not the only raptor of renown in these parts. As Pale Male’s celebrity grows in books, song and the recent documentary “The Legend of Pale Male,” a rural cousin has demonstrated equally remarkable, if less publicized, avian persistence. Among red-tails whose ages could be documented, she was the oldest ever found alive in the wild in North America. She first came into contact with humans when Joe Morgan and Pete Rose were playing for the Phillies in the World Series and Ronald Reagan was president. 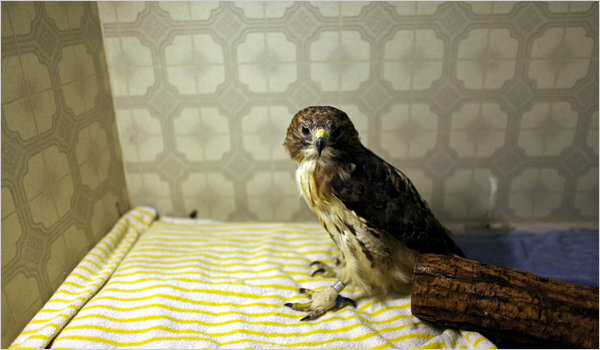 Red-tailed hawks are large, adaptable birds of prey that breed from Canada to Panama. This one was almost certainly born north of New York City, and she was captured and banded on Oct. 15, 1983 — coincidentally, by personnel at Dr. Soucy’s center. Ms. Gilbert fed her for a few days, realized the hawk had a respiratory problem of some kind that needed extra care and took her to Dr. Soucy’s raptor center, where the red-tail has been given food, medicine and treatment for a hairline fracture of a wing. The bird will be fed and observed at least through the winter. If she is fully healed and able to fly, she will probably be released back into the wild. Things have improved for red-tails since regulators began to curb the use of DDT and other harmful pesticides. And in some ways, the cleared landscape of highways and subdivisions has made it easier for them to find safe perches to hunt for mice, rats, squirrels and ferrets. In other ways, our comfort zone is their nightmare, in which a bird like this one over the years has managed to escape plate-glass windows, electrified utility lines, speeding cars, hunters’ rifles, windmill blades and other perils. City hawks, like Pale Male, face particular dangers from rats feeding on rat poison, which can kill both predator and prey, though there is plenty of rat poison in the country as well. As we are, a hawk is bred for survival and without concern for its victims in a world in which predator eventually becomes prey. So you romanticize it at your peril. Still, old age can be its own reward, burden or miracle. As we get older, this time of year feels as much about survival as about celebration, a time when, if we’re lucky, we find a secure perch for a few quiet weeks, to look back on obstacles overcome, mazes run, bullets dodged, refuges found. A holiday season shout-out to this tough old bird and to assorted tough birds, old and young, down here on the ground. Venture into the Ravine and learn to identify trees without the benefit of using their leaves as field marks. Co-sponsored by the Urban Park Rangers. This year's count will be held on SUNDAY, December 26, 2010. If you plan to join us on the count, please call me or the appropriate regional leader listed here. If any of the area leaders cannot continue as leader give me a call. This year's participation fee will remain at $5.00 for participants. The compilation dinner will be at the Lenoir Nature Center, 19 Dudley Street in Yonkers. The cost is only $10 and we'll have a great selection of hot food and fabulous homemade desserts by the great bakers from the Hudson River Audubon Society. The center will be open by 4:30 PM for those who need a place to meet and total up your birds or just warm up. The food and count down will begin at 6:00 PM or when the groups have their numbers ready. Fee: Free for Wave Hill Members/Non-members $5. Free for NYC Audubon Members with 2-for-1 admission to the grounds. Need to de-stress after all that holiday shopping? Take a brisk stroll with us through the woods. Discover Tour: Winter Tree I.D. Greetings. This is the New York Rare Bird Alert for Friday, December 17th 2010 at 5pm. The highlights of today's tape are VARIED THRUSH, ATLANTIC PUFFIN, DOVEKIE, RED PHALAROPE, BLACK-HEADED GULL, GREATER WHITE-FRONTED GOOSE, NORTHERN SHRIKE, LINCOLN'S SPARROW and WHITE-WINGED CROSSBILL. As we prepare for the Christmas Count season, noting that many of our areas recent rarities have departed, it's good to see that the Central Park VARIED THRUSH was still present Thursday around the Maintenance Field area. Recently it has been seen at various locations in the same general vicinity it has been frequenting but has now become more elusive, perhaps wandering about a bit. Thursday it was seen along the south side of the Maintenance Field which is reached by entering the park at 5th Avenue on the south side of the 79th Street transverse and continuing into the park across the roadway and to the maintenance buildings and adjoining small fields. Look around the field edge or on the upslope on the north side of the path near the restrooms. 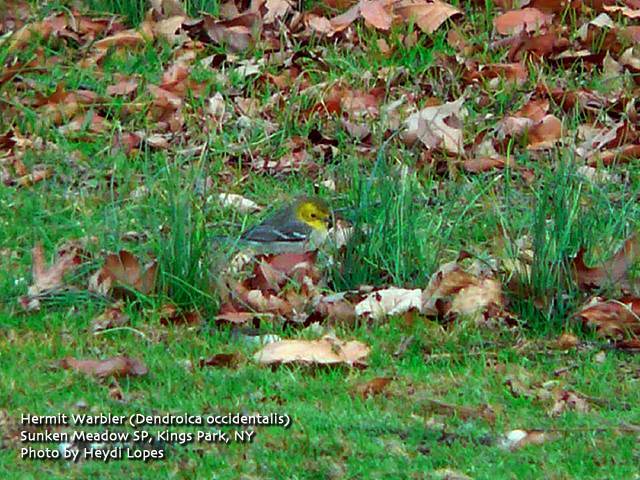 Also in Central Park a RED-HEADED WOODPECKER has been present along the southeast corner of the Sheep Meadow since Saturday and a LINCOLN'S SPARROW appeared in Riverside Park on Thursday. The GREATER WHITE-FRONTED GOOSE was found with Canadas on the parade ground opposite the Nature Center in Van Cortlandt Park in The Bronx last Saturday and seen again there briefly Sunday. 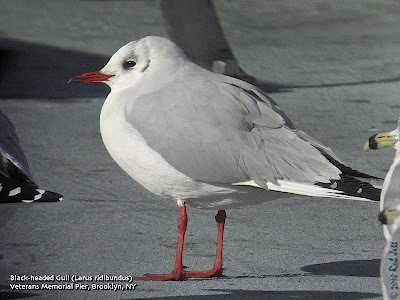 An adult BLACK-HEADED GULL was seen Wednesday roosting on the fishing pier at 69th Street near the Owl's Head waste water treatment plant in Bay Ridge Brooklyn presumably last year's bird back hopefully for another winter. A "Black" BRANT was found in a brant flock near the eco-village at Floyd Bennett Field in Brooklyn last Saturday. 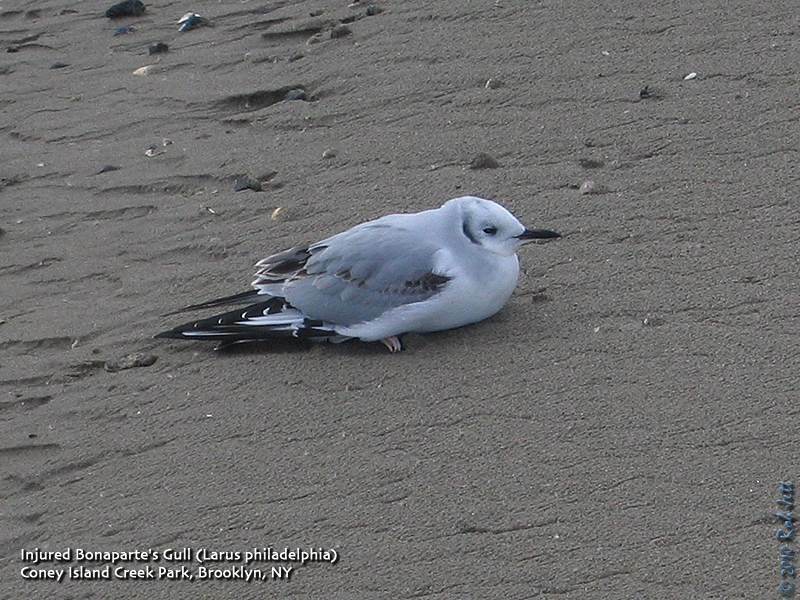 With searching, this subspecies has been located over the years in the brant flocks using this park or Riis Park and Fort Tilden across the channel. Out at Jones Beach West End 3 HARLEQUIN DUCKS continue to visit the boat basin next to the Coast Guard Station. A WHITE-WINGED CROSSBILL was noted in the median last Saturday. Another WHITE-WINGED CROSSBILL, a flyby, was reported from Sunken Meadow State Park on Monday. Today a BLACK-HEADED GULL was found in Jones Inlet off Point Lookout and a WILLET was also noted there with 22 AMERICAN PIPITS at West End. An ORANGE-CROWNED WARBLER was seen again at Massapequa Preserve today. Out east good numbers of RAZORBILLS continue mostly off Montauk Point where about 350 were estimated last Saturday. Also spotted Sunday were 1 or 2 BLACK GUILLEMOTS during the morning flight. Most of the large rafts of ducks were staying well offshore but also seen Sunday were a RED-NECKED GREBE and over 20 BLACK-LEGGED KITTIWAKES. Also on Saturday a DOVEKIE was found sitting off Ditch Plains in Montauk where another RED-NECKED GREBE and 25 PURPLE SANDPIPERS were present. An immature ICELAND GULL was spotted of Culloden Point with another Iceland at Montauk Harbor Inlet Sunday when a RED-NECKED GREBE was on Fort Pond Bay and 6 REDHEADS were on Fort Pond itself. Adult LESSER BLACK-BACKED GULLS were along Fort Pond Bay and at Lazy Point in Napeague, both back for another winter. 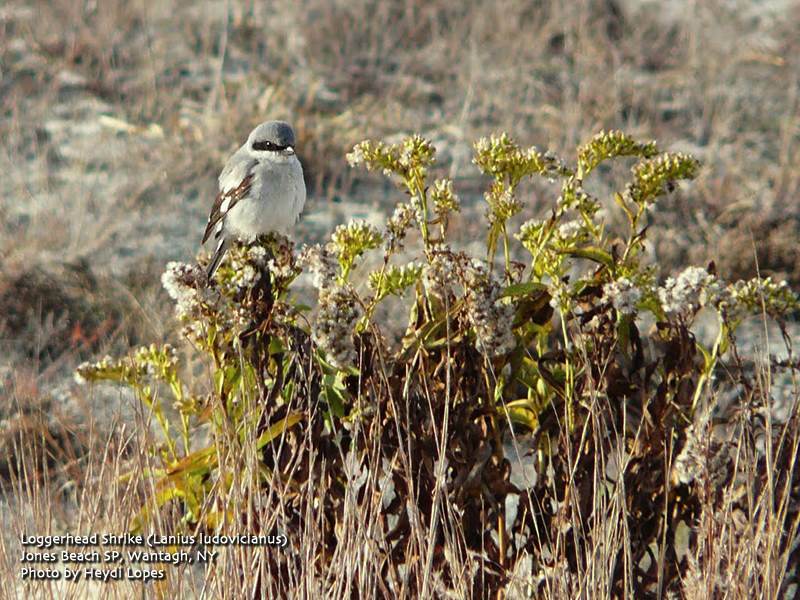 A NORTHERN SHRIKE was also present Saturday near the boat launch area at Lazy Point which is north of Route 27 at the end of Lazy Point Road. Noted in the goose flock, along Further Lane in East Hampton, were 4 GREATER WHITE-FRONTED and 2 CACKLING GEESE on Sunday. At Shinnecock Inlet birds seen Saturday featured 450 COMMON EIDER, 2 immature ICELAND GULLS and a few RAZORBILLS. A pelagic trip aboard a fishing boat going out about 35 miles south of Shinnecock Inlet counted 2,129 DOVEKIE and among them 35 ATLANTIC PUFFINS and 8 RED PHALAROPES last Saturday. We will for the next 3 weeks include Christmas Count highlights so please call in local count results on Long Island, call Tony Lauro at (631) 734-4126, or weekdays call Tom Burke at (212) 372-1483. The Black-headed Gull is a widespread Old World gull species which makes periodic, winter appearances along the northeastern coast of North American. This adult in non-breeding plumage was found within a flock of Ring-billed Gulls on Veterans Memorial Pier in Bay Ridge, Brooklyn. It may seem a little obsessive, but over the weekend Heydi and I went back to Coney Island to look for gulls and waterfowl. Unlike the previous two weekends, the weather was sunny and relatively mild. Fisherman were standing shoulder to shoulder along the rails of Steeplechase Pier. They alternately tugged and dropped long lines rigged with multiple, shiny lures. A few had their catch laid out on the fish scale spattered pier. The long, silver fish looked like some type of herring. I don't know if it was the nice weather or the period of fish migration, but there were so many fisherman on the pier that there was only a small opening at the very end for us to set up our scopes. From there we spied several hundred Bonaparte's Gulls far off shore. Farther in the distance, massive numbers of scoters moved across the horizon like rolling, black waves, too indistinct to determine the exact species. Near the western-most jetty, at Seaview, a single White-winged Scoter was still present. On the rocks behind her were 8 Purple Sandpipers. Following the same route as the previous two weekends, we left the bay side beaches and went over to Coney Island Creek. Red-breasted Mergansers seemed to have increased in numbers, as have Common Loons. 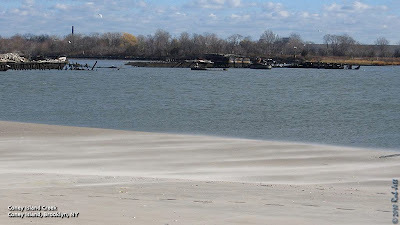 Like every other weekend, we found high numbers of Ring-billed Gulls, but nothing else out of the ordinary, so headed to Marine Park, followed by Dead Horse Bay, then winding up our efforts at Floyd Bennett Field. We never located any unusual gulls or waterfowl, but it wasn't for a lack of trying. The abundance and diversity of these two groups of birds has definitely increased over the last few weeks and will continue to as each new cold front moves through the northeast. Today began as the coldest day yet this season. The wind was blasting out of the west-north-west, making it feel like 10 degrees. I had some work in the morning but thought about taking a run over to the pier at Owl's Head Park in the afternoon to scan the gull flocks. Then Shane called me at about 11am confirming what I had hoped for ... the Black-headed Gull had returned to the Veteran's Memorial Pier next to Owl's Head Park! 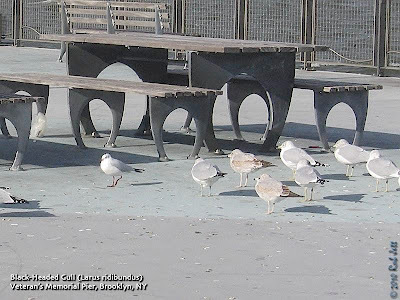 I stood on the exposed pier and scanned a few scattered flocks of Ring-billed Gulls for the smaller black-headed. There were white-caps on the bay and my tripod was vibrating in the arctic blast. Then I spotted the gull's deep-red legs and bill as he tried to stay warm and concealed among the larger, more drab gulls. After three weeks, I finally had my Black-headed Gull for 2010. I hope he sticks around for the Christmas Count. Prior to the turn of the century, people engaged in a holiday tradition known as the Christmas "Side Hunt": They would choose sides and go afield with their guns; whoever brought in the biggest pile of feathered (and furred) quarry won. Conservation was in its beginning stages around the turn of the 20th century, and many observers and scientists were becoming concerned about declining bird populations. Beginning on Christmas Day 1900, ornithologist Frank Chapman, an early officer in the then budding Audubon Society, proposed a new holiday tradition-a "Christmas Bird Census"-that would count birds in the holidays rather than hunt them. So began the Christmas Bird Count. Thanks to the inspiration of Frank M. Chapman and the enthusiasm of twenty-seven dedicated birders, twenty-five Christmas Bird Counts were held that day. The locations ranged from Toronto, Ontario to Pacific Grove, California with most counts in or near the population centers of northeastern North America. 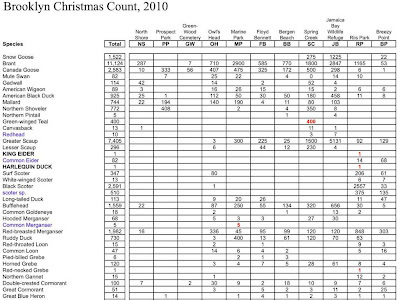 Those original 27 Christmas Bird Counters tallied around 90 species on all the counts combined. For more information, the New York State Ornithological Society has a page here. Spend the pre-holiday weekend out in nature, all while doing your part to support the bird population. Comments: Coordinator assigns trip leaders and participants, assimilating teams and establishing starting points with team leaders. Please call early as possible for participation in this great event. Time is needed to plan and figure out the details. The count dinner will be held at the Prospect Park Audubon Center. Help and assistance is needed for dinner setup, email Mary Eyster profmaryjo [AT] aol.com to volunteer. There is a $5 donation to Audubon required for the event. See your field leader for details. Meet at the South Pump Station of the Reservoir (inside the park at the southeast corner of the reservoir, near 85th St. and 5th Ave.). All counting groups will be escorted by the Urban Park Rangers. 12:30pm: Data tally and refreshments at the Arsenal Gallery (3rd floor of the Arsenal, at 64th St. off 5th Ave.). $5 registration fee payable the day of the event (children under 18 are FREE). Saturday, December 18, 2010, 10:00 a.m. to 2:00 p.m.
Meet at the bike path entrance on the Old Mill Road next to St. Andrews Church (the old one). We will walk along the path to the T-junction and either return by the Blue Trail above where we will cut invasive vines that strangle saplings there or work our way back along the bike path cutting invasive vines from saplings on the north side of the trail. If you don’t have your own, Protectors will supply gloves and pruners (& refreshments). After a two hour work session (our 174th consecutive monthly workshop), we will take a short walk over nearby trails. 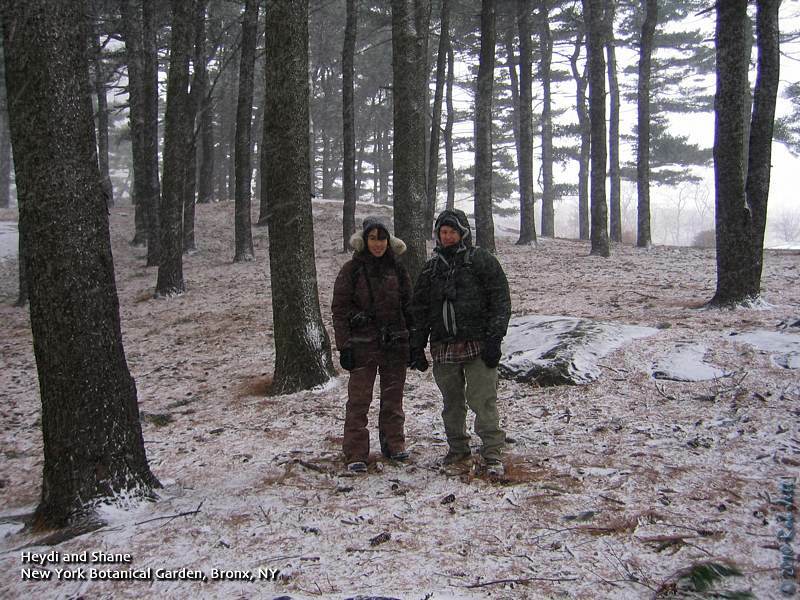 Saturday, December 18, 2010, 5:00 p.m. to 7:00 p.m.
Each winter Cliff Hagen surveys the local population of owls. Join the survey and help seek and count the owls of this watercourse that flows from the Goodhue Woods, through Alison Pond and into Snug Harbor. Meet at the entrance to Alison Pond. Flashlights are not so good when searching owls, but are acceptable. A planning meeting will be held THIS Wednesday, December 15th, 8pm, at the Alley Pond Environmental Center. 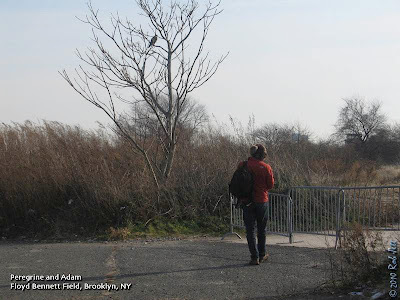 Experienced Birders: Join a team and count Staten Island's bird population. Part of the annual National Audubon Society count. To learn how to get on a team, call Ed Johnson at (718) 483-7110. Round up results, 7:30pm at the Museum. Greetings. 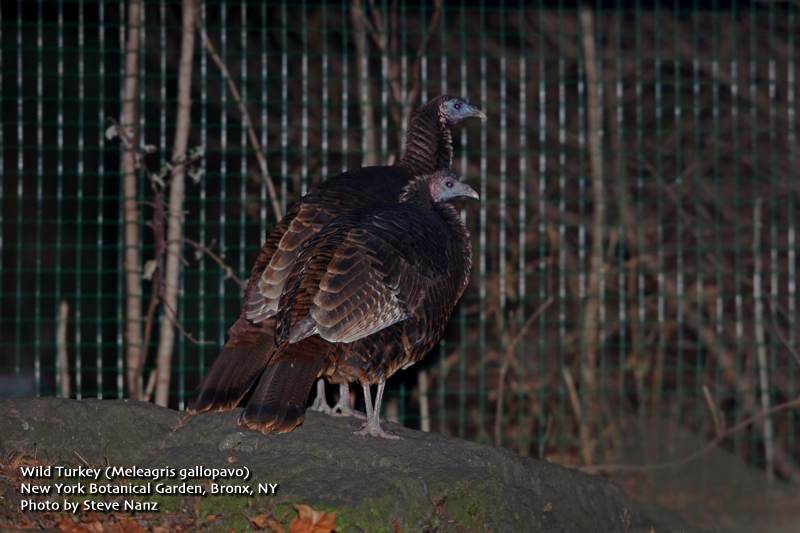 This is the New York Rare Bird Alert for Friday, December 10th, at 8:00pm. The highlights of today's tape are HERMIT WARBLER, VARIED THRUSH, LOGGERHEAD SHRIKE, BLACK GUILLEMOT, and more. New York's first HERMIT WARBLER, pending acceptance by NYSARC, was found last Saturday at Sunken Meadow State Park and entertained many birders as it fed primarily on the ground within a fairly limited area through Wednesday. Presumably a first fall female, the bird remained along a fence row just west of the traffic circle and flag pole at the end of the entrance road off Sunken Meadow Parkway. The area chosen by the warbler was sheltered from the persistent strong northwest winds, but perhaps due to a change in the winds yesterday and today, the warbler could not be relocated in that same area. It may still persist, but the colder temperatures would make subsistence more problematic. Please let us know if the warbler is relocated. The female-type VARIED THRUSH, in Central Park since November 28th, was still present around the maintenance area today. This site, on the south side of the 79th Street Transverse across the park, can readily be reached from Fifth Avenue. From 5th Avenue take the path into the park on the south side of the 79th Street Transverse, and continue up the hill and across the East Drive. Across the road, walk down to the maintenance buildings, including the Ramble shed, and look for the thrush along the upslope on the north side of the path, or along the perimeter of the small field on the south side of the path. The thrush does disappear at times, and patience may be required. A YELLOW-BREASTED CHAT was also in Central Park last weekend, near the Boathouse. The FORK-TAILED FLYCATCHER in Stamford, CT was last seen on Saturday the 4th, and there have been no recent reports of the COMMON GROUND-DOVE at Captree State Park. The LOGGERHEAD SHRIKE was still recently at the Roosevelt Nature Center at Jones Beach West End. 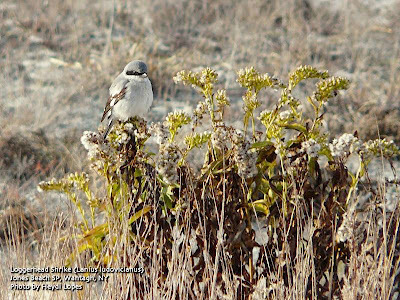 Look for the shrike especially in the dunes surrounding the boardwalk, and sometimes even using the boardwalk as a perch, but it can disappear for a while. 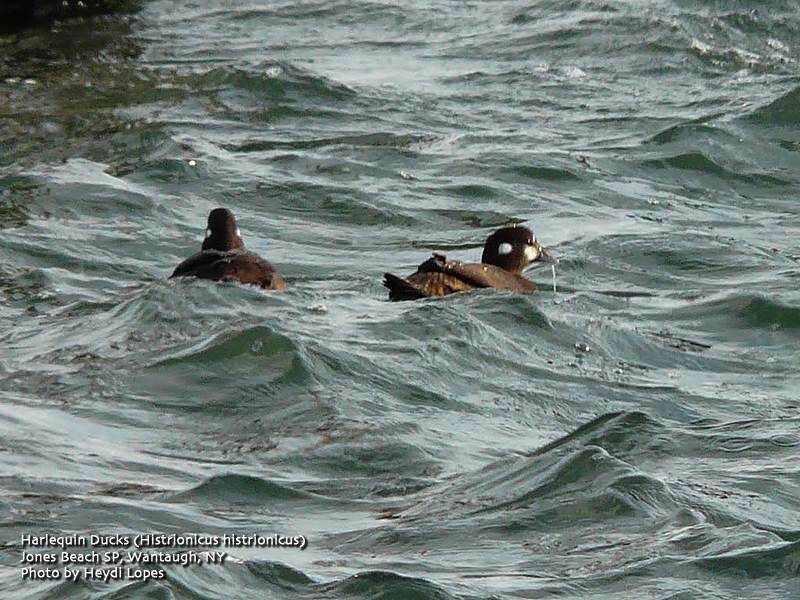 Up to three HARLEQUIN DUCKS have been frequenting the Jones Beach West End Boat Basin east of the Coast Guard Station and if not there, may be around the Point Lookout jetties. 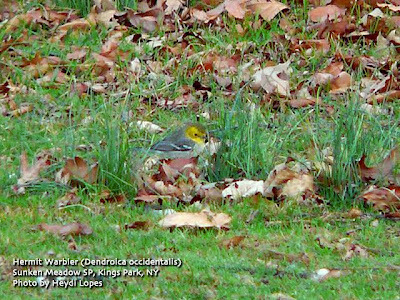 Also at West End, keep an eye out for a possible YELLOW-HEADED BLACKBIRD reported there last Sunday. Please let us know if this is confirmed. A CACKLING GOOSE was with Canadas on Belmont Lake State Park Wednesday, and two LAPLAND LONGSPURS were with Horned Larks at Floyd Bennett Field in Brooklyn today. Among the large concentration of ducks off Montauk Point last weekend were over 3,000 COMMON EIDER alone and many more scoters estimated there. Alcids spotted Saturday included 150 or more RAZORBILLS and a single BLACK GUILLEMOT seen only briefly. A BLACK VULTURE was seen around the Deep Hollow Ranch and the Roosevelt Third House County Park in Montauk on Sunday. Also out East, two Greater White-fronted Geese were in the flock of Canadas feeding along Further Lane in East Hampton on Saturday and if not seen there, check nearby Hook Pond. A dark ROUGH-LEGGED HAWK was spotted over East Hampton Wednesday, and a light morph was at Smith Point County Park in Shirley today. In Yaphank two adult Trumpeter Swans have returned to Upper Lake, north of Mill Road at its intersection with Main Street. NYSARC continues to monitor the New York sightings and breeding success of this species, which has not yet been added to the state list, given that the source of presumably all New York trumpeters is from reintroduction programs in surrounding states and provinces, as well as privately released birds within the state. Guidelines adopted by NYSARC regarding the accceptance of such species to the state list provide the basis for their ongoing evaluation. An interesting hybrid duck was seen in Mamaroneck, Westchester County, on Tuesday and Wednesday, but freezing conditions have kept it moving. Traveling with a group of Hooded Mergansers, the bird appears to be a Hooded Merganser x Goldeneye hybrid, possibly Barrow's Goldeneye. Winter has unquestionably arrived bringing with it lots of Black-capped Chickadees. It seems like this year they are much more abundant than previous years, so make sure you have plenty of sunflower seeds and suet to stock your feeders. This past weekend's birding started off slowly, with low temperatures, brutal winds and few birds I wasn't feeling too optimistic that I'd find anything new. However, it ended on a high note with a few new year birds including one New York State first. For the second weekend in a row, I took the "F" train to Coney Island for some early morning birding. My hope was of finding some unusual waterfowl or gulls - more specifically, a Common Eider, Black-headed Gull or Iceland Gull. I met Heydi at the Dunkin' Donuts on Stillwell Avenue, then we headed to the boardwalk to scan the open water for birds. We walked east along the boardwalk to West 8th Street, near the aquarium. Last year we learned that, during the winter months, flocks of seaducks can usually be found off the shore in that spot. They were not there on Saturday, however. Backtracking, we headed to Steeplechase Pier, adjacent to the Brooklyn Cyclone's ballpark. The fishing pier stretches nearly 1/4 mile from the boardwalk into the bay giving great views of seabirds in the surrounding waters. From the end of the pier we could see large numbers of gulls, gannets and waterfowl flying low to the water or diving for fish in the distance. There were also a couple of Common Loons and some cormorants. Most of the birds were frustratingly just beyond the line of heat distortion on the horizon, so went unidentified. After the pier, we continued walking towards Seaview. Resting in the sand along the western beaches were hundreds of Ring-billed Gulls. Several Black Skimmers with their massive bills tucked under wing tried to blend in with the small gulls. Next to the jetty at the western terminus of the public beaches was a female White-winged Scoter. Scoters are usually viewed in a scope from a fairly long distance, identification relying on general shapes, patterns and colors. Seeing one at such a close range on Saturday made it's detailed size, shape and color seem almost unfamiliar. 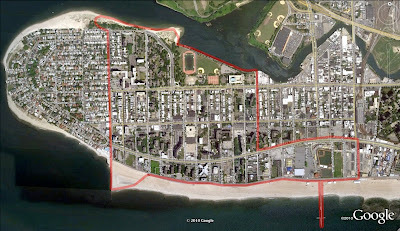 On the northern side of the Coney Island peninsula is Coney Island Creek Park. Shane introduced me to this stretch of greenspace (brownspace?) owned by the New York City Department of Parks and Recreation last year. It's a great spot to look for gulls, especially during west winds. On the previous Sunday he counted nearly 800 Bonaparte's Gulls and two Black-headed Gulls here. Instead of rare gulls, on Saturday Heydi and I found gale wind driven sand that stung the face like fire ants. In a tiny cove on the creek, just opposite Calvert Vaux Park, I spotted a single Bonaparte's Gull in the water only about 2 feet from shore. As we watched, it flew from the water onto the sand. When in the air, its right leg dangled like a wet rag. The leg was clearly broken, but there wasn't anything we could have done about it. The bird seemed otherwise healthy and would take off flying if I tried to get close. Perhaps he was resting on the shore so he didn't have to paddle his feet in the water against the strong winds. I've seen gulls with missing feet that seemed perfectly healthy, so hopefully this bird will survive. We warmed up with some hot chocolate and planned our next location. 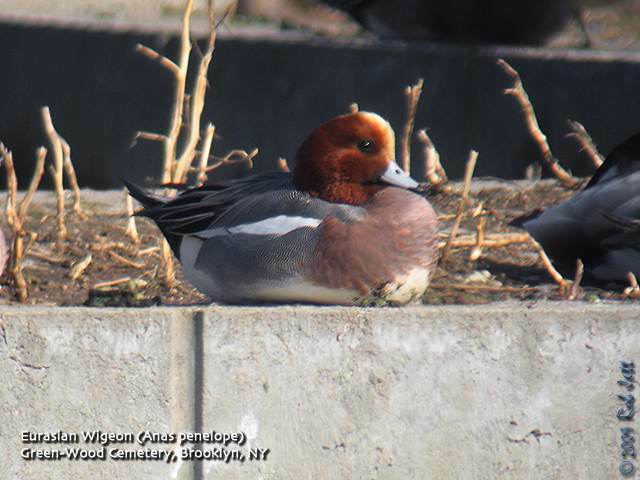 One of the waterfowl species missing from our year list was Eurasian Wigeon. 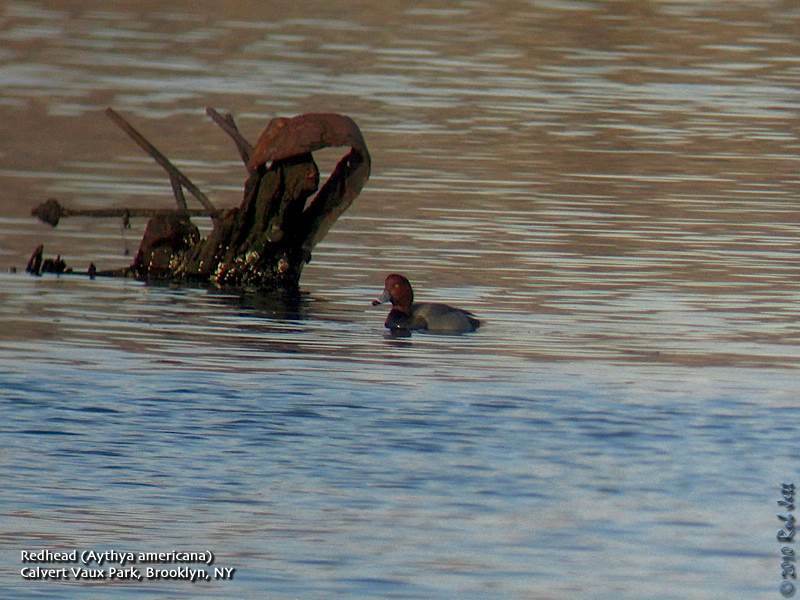 We made a list of all the locations where this rare duck has been seen in Brooklyn over the years - Floyd Bennett Field, Green-Wood Cemetery, Marine Park and Prospect Park. The closest spot was Marine Park, so we hopped back on the subway transferred to the B3 bus and arrived at the salt-marsh in about 20 minutes. It was low-tide, so we were able to set up our scopes close to the water on the west side of the creek. We scanned scattered groups of Pied-billed Grebe, Canada Goose, Brant, black duck, Mallard, Northern Shoveler, Bufflehead, Red-breasted Merganser and Ruddy Duck. To the south, Heydi spotted a few American Wigeons near some rotted wooden pilings. I had been focusing in the opposite direction and swung my scope around. The first bird I zoomed in on didn't have the dark-green and cream colored head of an American Wigeon, but rather the red head of an Eurasian Wigeon! I think I might have actually made an audible gasp when I focused in on the bird. Once I had Heydi on the bird, we picked up our scopes and moved down the shore to try and get a photograph. Of course when we got there the bird began moving to the opposite side of the creek then into the grass. We didn't get any pics. Just to give you an idea of how beautiful this duck is, I included a photo of one that I took in Green-Wood Cemetery last year. On Saturday morning, while Heydi and I were scanning gulls along Coney Island Creek, I received a phone call from Shane. Apparently, Vinnie Pellegrino, a young birder from Long Island, discovered a Hermit Warbler at Sunken Meadow State Park. This colorful songbird's range is normally restricted to California, Oregon, and Washington and there have been no accepted sightings of one in New York State. Shane had to be at work on Sunday by noon, but planned on trying for the warbler at first light. He'd be picking me up at 6am and Heydi by around 6:15am. Hopefully, the bird would still be around when we got there. When we arrived at Sunken Meadow strong northwest winds blowing across the Long Island Sound made it feel like a blustery 20 degrees, not typical warbler weather. It was a little past 7am and already there were about 12 birders present looking for the warbler. We walked to the grass a short distance west of the traffic circle, where the bird was last seen, and where a group of birders were lined up facing the northern edge of the lawn. I asked the first person I encountered if they had seen the bird yet, he pointed to a stretch of grass a few yards away and said, "It's right there". Sure enough, the tiny, bright yellow headed songbird was hopping around in the grass foraging for insects. Aside from the obvious seasonal incongruity and the fact that it is a western species, the bird is normally difficult to see because it forages near the tops of some of the tallest trees in North America. Yet, here she was, eking out a living on the ground along with some local White-throated Sparrows. This bird has quickly become the most recent celebrity during a year when New York has seen several rare species of birds and I often wonder about the fate of these individuals. Will the Hermit Warbler eventually reorient herself and head back west? Will she even be able to find enough food to survive this week's cold snap? She was still present as of Wednesday, but some day there will be a posting on the discussion group stating that the warbler "was not found". The odds are probably very low that she made it back to sunny California. I wasn't able to take any photos or videos but below is a very nice video shot by John Gluth. Check out his Flickr album of the Hermit Warbler here. Not having had to spend any time searching for the warbler we still had plenty of time left before Shane had to head to work. He suggested that we go to the south shore to look for the shrike at Jones Beach. 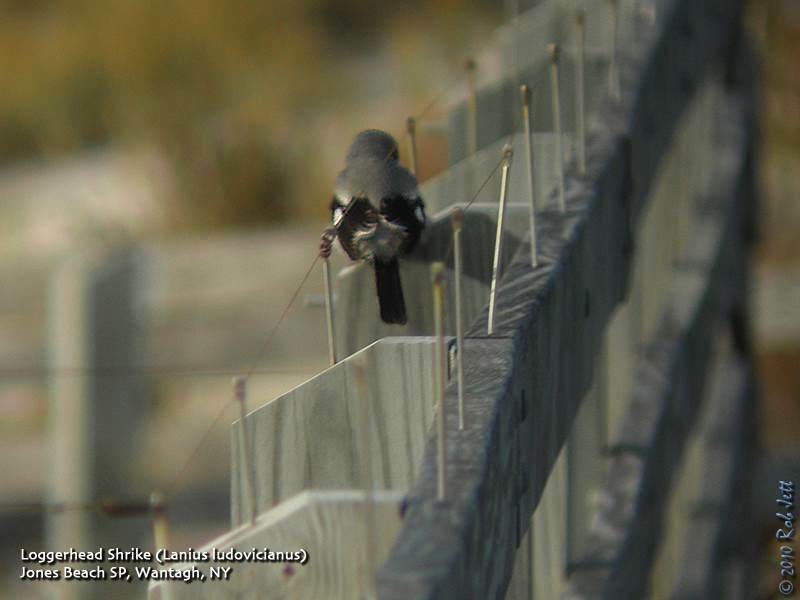 Back in late-October, Steve Nanz found the shrike at the Theodore Roosevelt Nature Center while leading a trip for the Brooklyn Bird Club. While he had some reservations about the identification, most birders accepted that it was a Northern Shrike. After over a month and much discussion, the experts finally agree that the bird is not a Northern Shrike, but rather the more southerly Loggerhead Shrike. Heydi and I struck out trying to find it during our trip on November 7th. It was good to have a second chance, especially since a loggerhead would actually be a new state bird for me. Three birders were already present when we pulled into the parking lot at the nature center. Two had been at Sunken Meadow when we arrived earlier that morning. Shane recommended that we walk a trail in the sand that looped around towards the dunes east of the center's boardwalk trail. As we were walking he mentioned in an offhand way that, a while back, someone had taken a nice photo of the shrike as it perched on the boardwalk's railing. Instinctively, I turned around and scanned the boardwalk. A woman with bins hanging around her neck was standing on the boardwalk, presumably, looking for the shrike. She was facing our group and made a shoulder shrugging gesture as if to ask, "Where is it?" It was at that point that I noticed that the Loggerhead Shrike was perched on the railing directly behind her. I shouted, "Turned around! ", then rushed back towards the boardwalk. The bird dove down to the ground. As I approached her and reiterated that the bird had been right behind her, she seemed a little confused. Then the shrike returned from the sand and perched a few yards away. Confusion turned to happiness. We spent the next 30 minutes watching this very cooperative bird as it hunted for insects from the nature center's boardwalk. It went from perching on the railing, to dried common mullein stalks, to a log below the walkway, to a cluster of dried wildflowers. While most birders were racing to Sunken Meadow State Park, we were having a private audience with a Loggerhead Shrike. We eventually had to leave but made one more stop across the road at the Jones Beach Coast Guard Station. I was already very happy with the results of our early morning birding. Perhaps it was the cold weather and my contented state of mind, but I only managed a superficial scan of the cove adjacent to the station and the bay. We had been standing next to the water for several minutes when Shane pointed out a pair of female Harlequin Ducks paddling along in the water right below the dock in front of us. Another great bird! The male of this species is one of our most colorful and beautiful waterfowl...not to take anything away from my favorite, the Wood Duck! We had seen three great birds, and several other very good ones, but, amazingly, it was only around 10am when we started heading back to Brooklyn. I didn't do any more birding that day because I figured that there was no way that I'd be able to top what I'd already seen.